Enjoy the best inspirational, motivational, positive, funny and famous quotes by Anna C Salter. Use words and picture quotations to push forward and inspire you keep going in life! Once, in a three-day taping that included several sadists, the material was so overwhelming that both the film crew and I got sick - I with a sinus infection, and the entire film crew with a flu so severe they had to delay their departure from the motel. Our immune systems had weakened, I believe, from the beating out souls had taken. 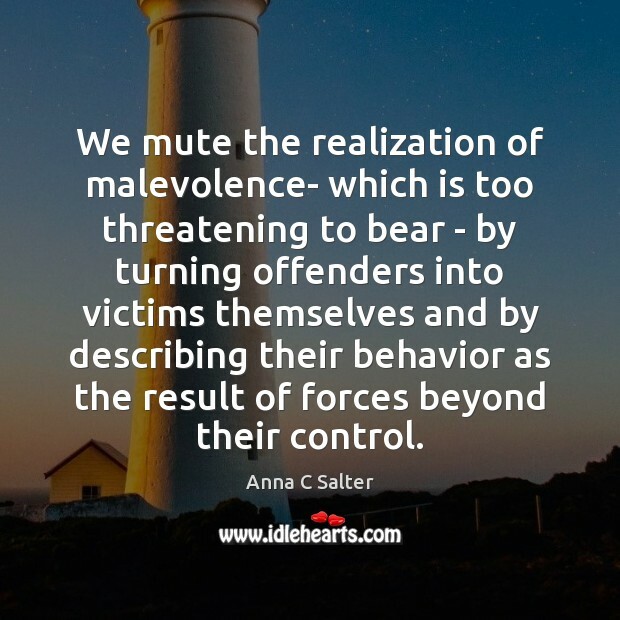 We mute the realization of malevolence- which is too threatening to bear - by turning offenders into victims themselves and by describing their behavior as the result of forces beyond their control. In all the interviews I have done, I cannot remember one offender who did not admit privately to more victims than those for whom he had been caught. On the contrarty, most offenders had been charged with and/or convicted of from one to three victims. In the interviews I have done, they have admitted to roughly 10 to 1,250 victims. What was truly frightening was that all the offenders had been reported before by children, and the reports had been ignored. Over and over victims are blamed for their assaults. And when we imply that victims bring on their own fates - whether to make ourselves feel more efficacious or to make the world seem just - we prevent ourselves from taking the necessary precautions to protect ourselves. Why take precautions? We deny the trauma could easily have happened to us. And we also hurt the people already traumatized. 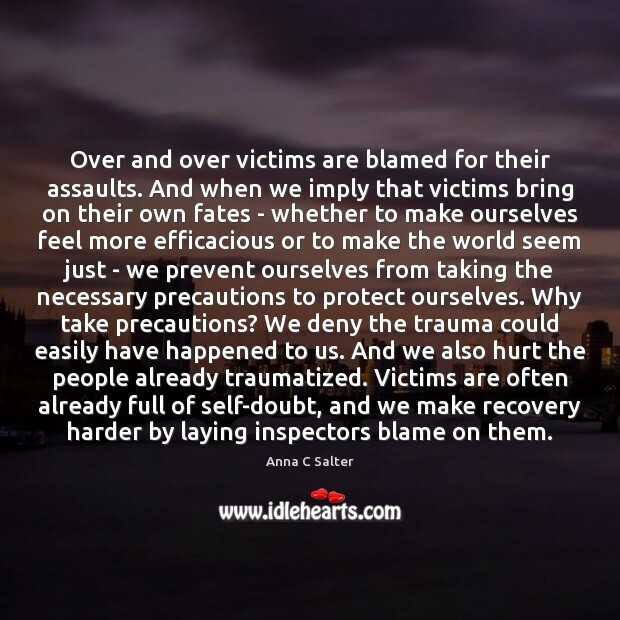 Victims are often already full of self-doubt, and we make recovery harder by laying inspectors blame on them.